Recent work from an MIT lab may help 3D printing fulfill its long-standing promise to transform manufacturing by enabling the rapid design and production of customized and complex objects. Key to 3D printing is a printhead that deposits successive layers of material onto a surface until the final three-dimensional object is complete. The researchers have designed a novel printhead that can melt and extrude material with unprecedented speed. The system can create a complex handheld object in a few minutes rather than the hour required by a typical desktop 3D printer. The researchers have also demonstrated a room-temperature process for 3D printing with cellulose—a renewable, biodegradable alternative to the plastics now generally used. To show the chemical flexibility of cellulose, they’ve mixed in an antimicrobial dye and printed a pair of bacteria-resistant surgical tweezers. Imagine a world in which objects could be fabricated in minutes and customized to the task at hand. An inventor with an idea for a new product could develop a prototype for testing while on a coffee break. A company could mass-produce parts and products—even complex ones—without being tied down to part-specific tooling and machines that can’t be moved. A surgeon could get a bespoke replacement knee for a patient without leaving the operating theater. And a repair person could identify a faulty part and fabricate a new one on site—no need to go to a warehouse to get something out of inventory. A common method of 3D printing—extrusion—starts with a polymer rod, or filament. The filament is heated, melted, and forced through a nozzle in a printhead. The printhead moves across a horizontal surface (the print bed) in a prescribed pattern, depositing one layer of polymer at a time. On each pass over the print bed, instructions tell the printhead exactly where material should and shouldn’t be extruded so that, in the end, the layers stack up to form the desired, freestanding 3D object. “So rather than starting with a solid block and grinding material away, in 3D printing—also called additive manufacturing—you start with nothing and build up your object one layer at a time,” explains Hart. Engineers have used 3D printing as a tool for rapid prototyping since its invention some three decades ago, but in recent years its use has expanded. Hart credits that expansion to better 3D printers but also to the widespread adoption of computer-aided design, or CAD, and emerging software tools for 3D shape optimization. Today’s designers can use CAD software to create a virtual 3D model of their targeted product, and in the process they generate a digitized description of it. That description can feed into software that develops the instructions for controlling the path of the 3D printer. As a result, designers no longer have to confine themselves to structures that can be made by machining or molding. “For instance, you can make an airplane seat with a complex internal structure that makes it light and saves fuel in flight,” notes Hart. 3D printing has made great strides, but it’s still a long way from what Hart envisions. Two recent advances out of his lab may help accelerate the adoption of 3D printing: a machine that can print hand-held objects far faster than today’s desktop 3D printers can, and a process for using cellulose as an inexpensive, biorenewable replacement for the usual plastics. 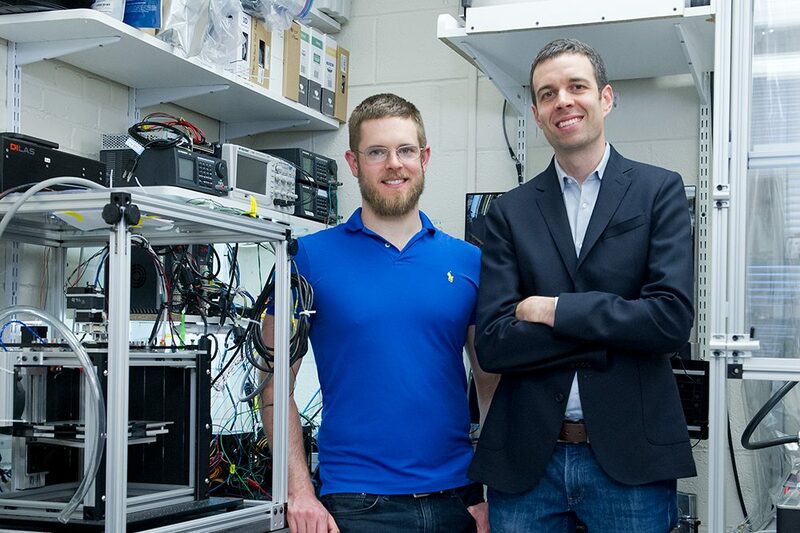 To find out what slows down current 3D printers, Hart, Jamison Go SM ’15, now a mechanical engineer at Desktop Metal, and Adam Stevens SM ’15, now a doctoral student in Hart’s lab, examined several commercial, extrusion-based desktop models and concluded that their so-called volumetric building rates were limited by three factors: how much force the printhead could apply as it pushed the material through the nozzle; how quickly it could transfer heat to the material to get it to melt and flow; and how fast the printer could move the printhead. Based on those findings, they designed a machine with special features that address all three limitations. In their novel design, a filament with a threaded surface goes into the top of the printhead between two rollers that keep it from twisting. It then enters the center of a rotating nut, which is turned by a motor-run belt and has internal threads that mesh with the external threads on the filament. As the nut turns, it pushes the filament down into a quartz chamber surrounded by gold foil (see the figure below). There, a laser enters from the side and is reflected by the gold foil several times, each time passing through the center of the filament to preheat it. The softened filament then enters a hot metal block, which heats it further (by conduction) to a temperature above its melting point. As it descends, the molten material is further heated and narrowed and finally extruded through a nozzle onto the print bed. Cutaway model of the novel MIT printhead In the “fast fused filament fabrication” (Fast FFF) printhead, the threaded filament enters from the top and is pulled along by a rotating nut that has matching internal threads for maximum contact. It passes into a quartz chamber covered by gold foil. There, a laser beam enters from the side and is reflected through the core of the filament to preheat it. The filament then passes into a hot metal block, where it melts before being extruded out of the nozzle. That design overcomes the limits on force and heating that slow current 3D printers. In a standard printer, the filament is pushed by two small, rotating wheels. Add more force to speed things up, and the wheels lose traction and the filament stops moving. That’s not a problem with the new design. Matching the threads on the filament and the nut ensures maximum contact between the two. As a result, the system can transfer a high force to the filament without losing its grip. The standard printer also relies on thermal conduction between the moving filament and a heated block, and that process takes time. At a higher feed rate, the core may not completely melt, with two impacts: Pushing the material through the nozzle will be harder, and the extruded material may not adhere well to the previously deposited layer. Preheating the filament with a laser ensures that the filament is thoroughly melted by the time it reaches the nozzle. To demonstrate their system, the team printed a series of test objects, including those shown below. Printing a pair of eyeglass frames took 3.6 minutes, a small spiral cup just over 6 minutes, and a helical bevel gear (a circular gear with angled teeth) about 10 minutes. Microscopic examination of the objects confirmed that the individual deposited layers were highly uniform at 0.2 mm thick, and tests of their mechanical properties confirmed that they were strong and robust. To better evaluate their printer, the researchers used it and several commercial desktop models to print the same object—a triangular prism 20 mm tall. For a comparable resolution (based on nozzle diameter and layer height), their printer achieved an average volumetric build rate up to 10 times higher than the desktop models. It even did three times better than an industrial-scale system that has a significantly larger printhead and motion system, and costs over $100,000. Another critical component of Hart’s vision for 3D printing is the ability to process materials that are abundant and environmentally friendly. Hart and Sebastian Pattinson, a former postdoctoral fellow in mechanical engineering who is now a lecturer at the University of Cambridge, United Kingdom, demonstrated a technique using the world’s most abundant natural polymer: cellulose. Cellulose offers many advantages over current plastics-based feedstocks: It’s inexpensive, biorenewable, biodegradable, mechanically robust, and chemically versatile. In addition, it’s widely used in pharmaceuticals, packaging, clothing, and a variety of other products, many of which could be customized using 3D printing. Past efforts to 3D print cellulose have largely been unsuccessful. The problem is that the abundant hydrogen bonding between the cellulose molecules—the thing that makes it strong in plants— makes it not conducive to 3D printing. Heat up cellulose, and it decomposes before it becomes sufficiently flowable to extrude from the nozzle of a printhead. To solve that problem, Hart and Pattinson worked with cellulose acetate, a chemically treated form of cellulose that has fewer hydrogen bonds. The figure below shows the process. They first dissolve the cellulose acetate in an acetone solvent to form a viscous feedstock, which flows easily through the printer nozzle at room temperature. As the mixture spreads across the print bed, the acetone solvent rapidly evaporates, leaving behind the cellulose acetate. Immersing the finished cellulose acetate object in sodium hydroxide removes the acetate and restores the cellulose with its full network of hydrogen bonds. Process for 3D printing of cellulose Cellulose acetate dissolved in acetone is fed through the nozzle of the printhead onto the print bed below. The acetone quickly evaporates, leaving layers of cellulose acetate. The printed object is subsequently immersed in sodium hydroxide to remove the acetate, leaving a finished product of pure cellulose. Using that procedure, the researchers printed complex objects out of their cellulosic materials, and the mechanical properties of the parts were good. Indeed, after the sodium hydroxide treatment, their strength and stiffness—measured in any direction—were superior to those of parts made out of commonly used 3D printing materials. One option the researchers explored was adding antimicrobial properties. They printed a series of disks, some from plain cellulose acetate and some with an antimicrobial dye added, and deposited a solution containing E. coli bacteria on each one. They then left some of the disks in the dark and exposed others to light from a fluorescent bulb like those used in laboratories and hospitals. Analysis of the bacteria surviving after 20 hours showed that the disks made with dye and exposed to the light had 95% fewer bacteria than the others. As a sample product, they printed the surgical tweezers shown in the photo below—an instrument that could be highly valuable in any surgical setting where ensuring sterility might be an issue. Hart hopes that these and other developments coming out of his lab will help advance 3D printing. But there’s another critical element that’s needed: a workforce knowledgeable in both the technical and business aspects of additive manufacturing. To that end, he teaches a graduate-level MIT class in additive manufacturing, which is proving highly popular; and in 2018, he launched an online professional course via MIT xPRO that enrolled nearly 1,200 people during its first run. He also offers a five-day, on-campus MIT Short Program that has attracted worldwide participants who want to learn about using additive manufacturing in their design and manufacturing operations. He is now leading MIT’s new Center for Additive and Digital Advanced Production Technologies, and plans are in the works for symposia at which its members will share their knowledge, ideas, and experiences. The enthusiastic response to these offerings suggests that Hart’s vision of 3D printing and digitized design and production may at last be on its way to becoming a reality. J. Go and A.J. Hart. “Fast desktop-scale extrusion additive manufacturing.” Additive Manufacturing, vol. 18, pp. 276–284, 2017. Online: doi.org/10.1016/j.addma.2017.10.016. fused filament fabrication and guidelines for high-throughput system design.” Additive Manufacturing, vol. 16, pp. 1–11, 2017. Online: doi.org/10.1016/j.addma.2017.03.007. S.W. Pattinson and A.J. Hart. “Additive manufacturing of cellulosic materials with robust mechanics and antimicrobial functionality.” Advanced Materials Technologies, vol. 2, 2017. Online: doi.org/10.1002/admt.201600084.